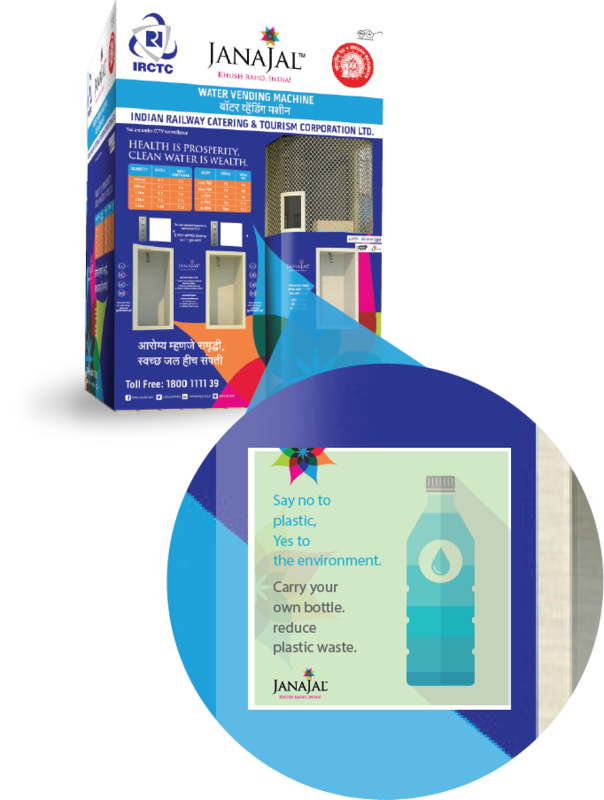 JanaJal - making safe drinking water affordable, accessible and available! 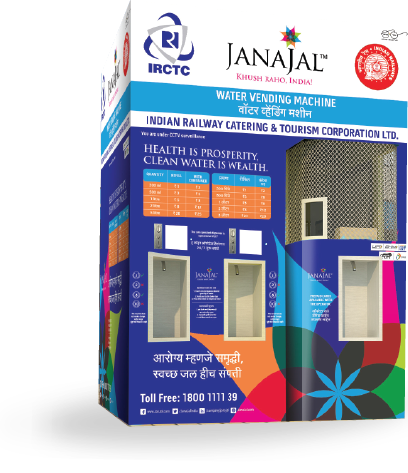 JanaJal envisions building India’s first water-sharing economy and the largest decentralized water distribution network through installation and operation of water ATMs. The company is working to make safe drinking water available, accessible, and affordable to the common man in a sustainable manner. The JanaJal Hybrid Water ATMs maximize efficiency by utilizing solar energy and regular electricity thereby minimizing down time due to power outages. Utmost care is exercised to ensure that our systems contribute towards a better environment through high efficiencies both qualitatively and quantitatively. We encourage consumers to carry their own bottles and containers to collect water thereby reducing the generation of hazardous plastic waste. By providing jobs and training people to operate our water ATMs, we create social entrepreneurs who serve communities with utmost dignity and pride. JanaJal adopts various implementation models with 24X7 real-time monitoring and supervision of every water ATM. Every JanaJal water ATM is monitored from a central Control Centre which surveils daily operations and collection of revenue through cloud based IT system. The systems are manned by a trained operator with consistent on-site system support and customer interaction. 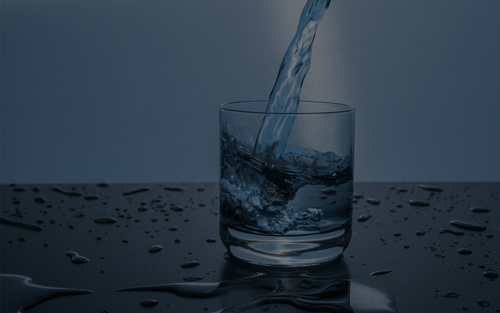 We believe in evolving and adapting water treatment technologies to solve different water related issues. Given that water changes every 5-10 kms in India, every water ATM is custom built to suit the environment in which it is intended to operate in. Our water ATMs are robust and have a 10-year lifespan. The dispensing capacity extends upto 15,000 litres per day per system and can further be increased due to the modular nature of the water treatment systems. 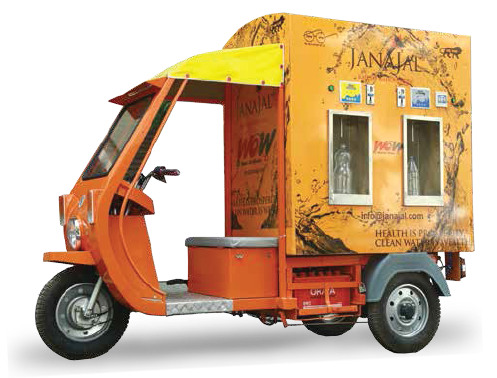 In order to increase accessibility and reach, we developed JanaJal WOW, our unique mobile water ATM that is a custom built deep tech enabled battery operated vehicle. Technology is the backbone of our operations and we at JanaJal continue to invest heavily in cutting edge technologies across diverse applications so as to improve our services and maximize efficiency across our operations. 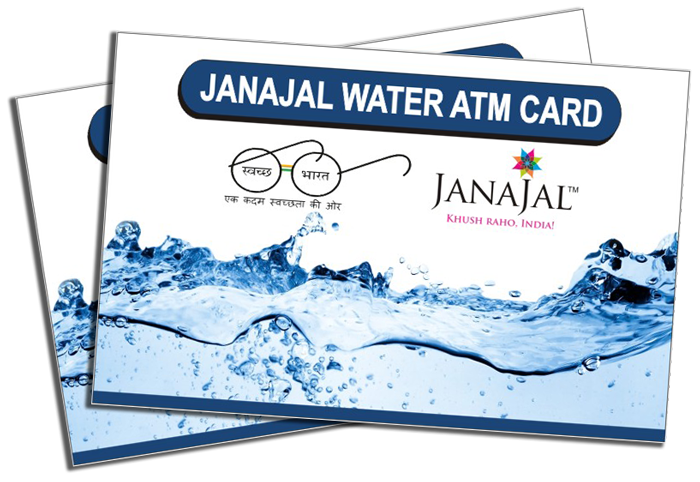 Consumers are offered the option of transacting through use of JanaJal Prepaid water ATM cards, or even coins/cash at our touch-screen enabled water ATMs, 24x7. 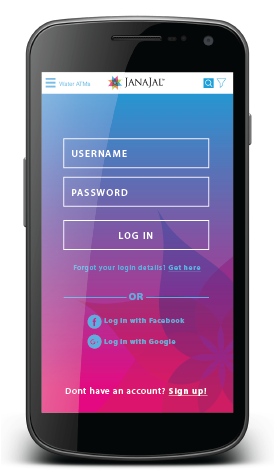 Recently introduced payment gateways and apps such as UPI and BHIM are also enabled at every water ATM. Securing the daily dose of potable water for drinking and cooking by every household can be a challenge in the developing world. The source of water is often found at significant distances away from habitations especially in rural areas. JanaJal WOW was developed with the singular objective of delivering water to peoples’ doorstep thus allowing women increased economic productivity and children the time to focus on education. 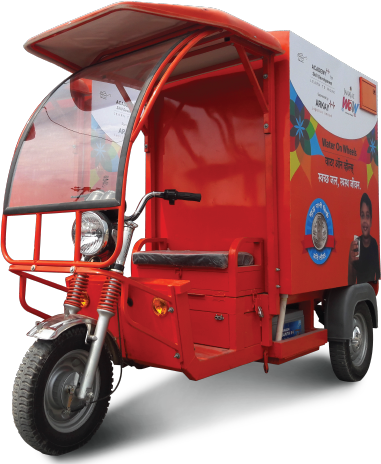 This environment-friendly battery operated vehicle helps take safe water to households and contributes to our 'Right to Water' mission.